As situation turned violent, Pakistan Electronic Media Regulatory Authority (PEMRA) ordered to shut down transmission of all news channels as the crackdown against the protestors staging sit-in at Faizabad interchange has sparked countrywide protests. Some reports claim Tv channels in Faisalabad have also gone off air. Currently, all news channels are blocked in Islamabad to prevent the live coverage of the security operation that began after 20 days of protest. 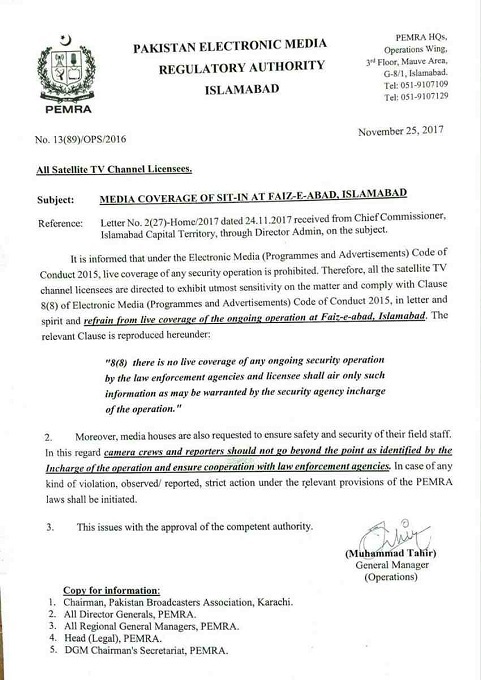 ARY News is claiming that Shahid Khaqaan Abbasi, the Prime Minister of Pakistan, has asked PEMRA to put off-air all TV channels in Pakistan. According to the latest news, a policeman was martyred and 100 other people including policemen were injured and being shifted to different hospital after the crackdown was launched at Faizabad Interchange. Many people are in support of the media ban, saying that the live coverage of a sensitive issue will only create chaos and incite religious-minded people in other cities. Electronic #media, news channels have done more damage today than the protesters. You, the news channels, have instigated protests in various parts of the country. #PEMRA you woke up late, damage has been done. Today’s unsung heroes are law enforcement agencies, police . Meanwhile, many Pakistanis are against the media blackout, urging that information must go out and people have a right to be aware of the current situation through media. Mediapersons, especially TV journalists, agree that Pakistani news channels are somewhat responsible for the ban because of misleading reporting.